“She decided to start living the life she had imagined.” That was the “sign,” literally on a sign, that made two sisters look at each other, smile, and know they were about to make a very important decision together. Since she was 16, and a receptionist at an Aveda hair salon, Ninna fell in love with the smells and sounds of the beauty industry, and decided that someday she would own her own salon. A passion for the numbers, operations, and behind-the-scenes business side of the industry took Ninna down the path of finance, HR management, and marketing rather than cosmetology school. “Those who can’t do, teach,” she always says, and her experiences of managing salons and being a small business banker helped give her the tools she needed to follow her calling. The sisters grew up with Aveda and were exposed to the products and culture at a young age. Being drawn to the mission and promise to be environmentally responsible, Ninna and Gaby knew they wanted the salon to be a part of the Aveda community. The salon opened October 2013 and Gaby told Ninna that she had also fallen in love with the smells and sounds and wanted to stay on board, not just as a silent partner. Gaby still works her full-time job but found a passion for photography and now curates the salon’s social media presence. And Ninna, the boss lady around here, gets to do what she loves every day now at the salon. 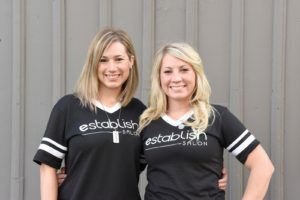 At Establish Salon, we make every effort to inspire creative and thoughtful results, personal growth, teamwork, innovation, and community involvement while creating beautiful hair. We commit to being productive and beneficial each and every day. We aspire to be the best version of ourselves and encourage each employee and client to establish their identity and thrive.